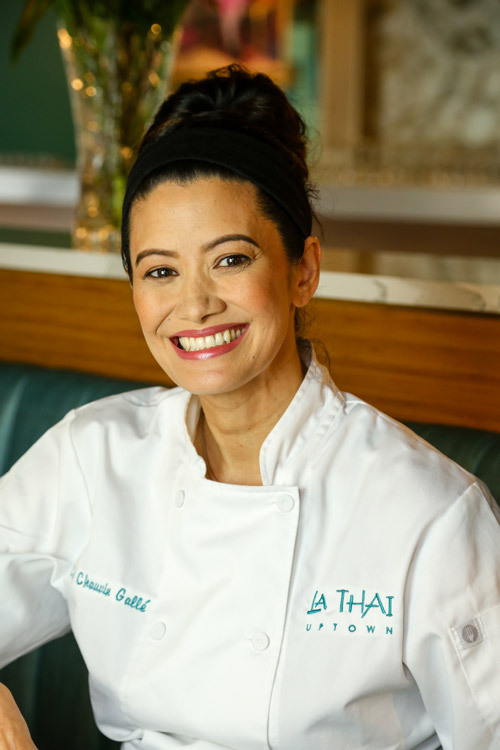 Chef Diana Chauvin Gallé has devoted her career to building a bridge between the culinary traditions of Thailand and her native New Orleans, bringing familiarity, excitement, and carefully balanced flavors to her acclaimed, neighborhood restaurant, La Thai, in uptown New Orleans. She has garnered critical acclaim for highlighting the natural parallels between the cuisines of Southeast Asia and Southeast Louisiana, marrying the flavorful spices of Thailand and the extraordinary bounty of Louisiana seafood. Some will say the restaurant industry and female entrepreneurialism run in the family - Diana’s mother is affectionately known for opening New Orleans’s first authentic, Thai restaurant, “Mai Tai,” in the 1970s. At just six years old, Diana received her first taste of the restaurant industry by mimicking her mother’s every move. A first-generation Thai and Cajun chef, Diana spent her young years bussing tables and waiting on guests. After attending Loyola University New Orleans, Diana relocated to the West Coast to further explore the unique sidewalk cafes, bistros and restaurants of Beverly Hills, Hollywood, and Santa Monica. There she gained valuable experience that would later help shape the vision for what would soon become La Thai. She opened La Thai, the restaurant credited with introducing contemporary Thai cuisine to the New Orleans culinary landscape, in 2008. For La Thai’s menu, Diana has taken time-honored recipes passed down from both her mother and grandmother. In some instances she serves dishes in their traditional, authentic form and in others, she adapts them for the New Orleans palette, utilizing the Crescent City's produce, ingredients & seafood from local waters. La Thai has been named the “Best Thai Food” in New Orleans by Gambit and Where Y’at Magazine, among others. Diana is a mother and currently resides with her husband Jay, her son Gage and daughter Mila in Metarie, LA. When she’s not in the kitchen, Diana is adamantly pursuing design projects, practicing yoga, and supporting local and national charities including Fore! Kids Foundation, St. Jude Children’s Research Hospital, Louisiana SPCA, and Eat Fit NOLA, among others.